Best Choice 8-in-1 XL Air Fryer (SKY5182) has a 11.6 quart capacity and a 1700 watt power (120V, 60Hz) motor to handle large amounts of food. 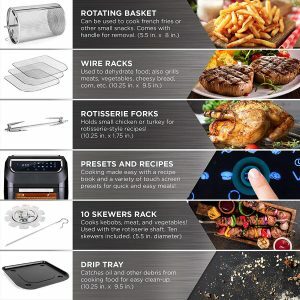 It is an air fryer, food dehydrator, rotisserie, and oven- a total kitchen cooking set that comes with 8 accessories to perform these different tasks. You will be able to cook for the whole family in this large multifunctional 8-in-1 cooker. The latest rapid air technology circulates the hot air all over the interior. And you only need very little or no oil to cook the fried foods with the same taste and texture of the deep fried. 80% less oil will be used, which means there won’t be any unwanted oil or fat. You can dehydrate fruits and veggies or other ingredients and make beef jerky on three roasting racks for more than 8 hours. Tasty rotisserie type meals can be prepared with the 360-degree rotating system. It also comes with the handy defrost and preheat functions when you need them. There is an oven type door with a stainless steel handle and a large viewing window that lets you monitor the progress of your cooking without opening the door and letting the heat out. The interior wall is the FDA-grade galvanized steel and there will not be any unwanted or unpleasant plastic smells. As an ETL-certified cooker it is perfectly safe to use with a heat-resistant housing, micro-switch and overheating protection, automatic shut-off and anti-slip feet. It is easy to operate this unit and prepare meals with it and you’ll get more than 30 recipes included. It will be much easier to cook chicken, beef, seafood, cookies, cakes, different side dishes etc. The 11.6 qt capacity Best Choice Air Fryer weighs 16.5 pounds and measures 12.75 x 12.25 x 14.5 inches outside and 10.5 x 9.5 x 7.25 inches inside. And it comes with a 42-inch long power cord. You’ll prepare your fried and other meals in a much healthier way without the additional fats, oils and calories. And you’ll complete your cooking in a much shorter time than with a conventional oven or stove-top. This oven has a large enough capacity to cook a whole chicken. You just select what you want to cook via the LCD-backlit display panel. It is made of iron, aluminum, and galvanized steel with solid plastic bits. It comes with a few accessories- you’ll get the wire racks, rotating basket, 2 x 10 skewers rack with 10 skewers, a rotisserie pan, a rotisserie shaft, 3 roasting racks, 2 rotisserie forks and a drip pan included in the box. The default temperature is set to 370 degrees Fahrenheit and the time is 15 minutes and these are easily adjustable. The temperature range on this oven is 150 to 400 degrees Fahrenheit. You won’t need to assemble anything when it is shipped to your address as it is a simple plug and play type of cooker. You can fit in quite a lot, cooks very quickly and the food comes crunchy on the outside and moist on the inside. You’ll eat better and healthier and save money by not using your large gas or electric oven. 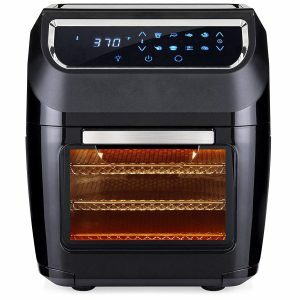 It is a very functional and practical air fryer at a very reasonable price that we highly recommend.